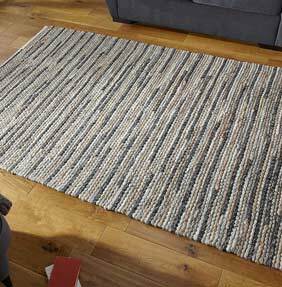 A new addition to our ever expanding wool range of pebble style rugs. Savannah is hand-woven from 100% chunky felted yarn, this type of of yarn creates a soft textured and durable rug with loads of depth and comfort. The graded, un-dyed wool is ultra natural and as a result, each colour way is extremely neutral and subtle. Choose from four colours, each woven in three standard sizes.